We are excited to have a new website design up right in time for the arrival of Spring in San Diego! The site is built on a custom WordPress template, and we have added a lot of new work! On each information page for our web design/development services we’ve added scrolling mini-portfolios so that you may view our work as you read up on each service that we provide. For a quick sampling of our web design, web development, e-commerce solutions, WordPress templates & landing pages, visit our featured work page. 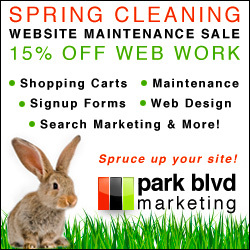 Also, we have a Spring Cleaning Web Work sale going on this season, with 15% off of all of our services! If you’d like to inquire about how our custom web design can enhance your business, or how online marketing can drive traffic to your website, click here or call (619) 309-8537 to contact San Diego’s Boutique Web Agency!